Too many in the world know today’s Dominican blessed for a nickname given to him more than his religious name. 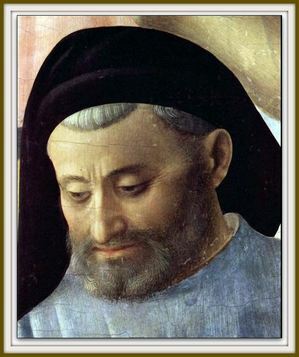 The Dominicans celebrate Blessed John of Fiesole, the post modern world would know him as Fra Angelico (1387-1455), people in his time also knew him as Guido. His talent and grace was indeed rare among people. Only in 1982 did the Church with Pope John Paul II recognize John’s holiness. A prior post gives a very brief history and the liturgical prayer for Blessed John’s feast day here and a 2009 post is here. In the Order of Friars Preachers today is the feast of day of Blessed Jordan of Saxony. Blessed Jordan, from Paderborn, Germany (a Saxon noble) known for his piety and charity, was educated at the famed University of Paris. 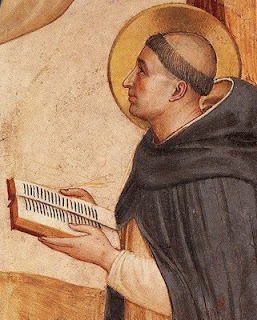 In 1220, he was admitted to the Order by Saint Dominic himself in and a year later was the Prior Provincial for the friars in Lombardy, and a year later he succeeded Dominic as the Master of the Order. 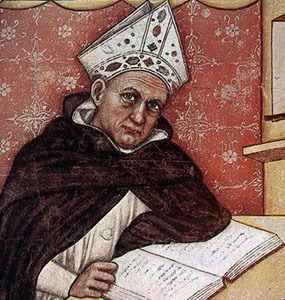 Blessed Jordan’s preaching was known to be powerful to the point of bringing Saint Albert the Great to the Order and by extension you might say that he brought Thomas Aquinas to the fraternity. Jordan died in a shipwreck off the coast of Syria in 1237 on a pilgrimage to the Holy Land. Pope Leo XII beatified Jordan in 1825. The Collect is noted here. O God, who made Saint Thomas Aquinas outstanding in his zeal for holiness and his study of sacred doctrine, grant us, we pray, that we may understand what he taught one imitate what he accomplished. 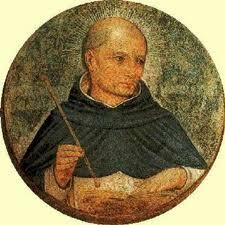 Saint Thomas Aquinas, patron of Catholic school teacher and researchers, pray for us. a dilemma arose: are faith and reason in conflict with each other or not? Today’s the feast of the great Dominican saint, Martin de Porres (1579-1639). A native of Peru, he was the son of a slave mother and a Spanish father (who weren’t married). Each day I pass Saint Martin’s altar sometimes aware of De Porres’ supreme affection for Jesus and intense love for his brother and sister; other days, not so aware. But aware or not, my love for Saint Martin has only grown in recent times because I recognize in him an authentic and recognizable model of Christian charity and the desire to seek the Face of God in prayer. Do you desire to be Christ, to follow Christ more closely? Walk on the path that Saint Martin shows….